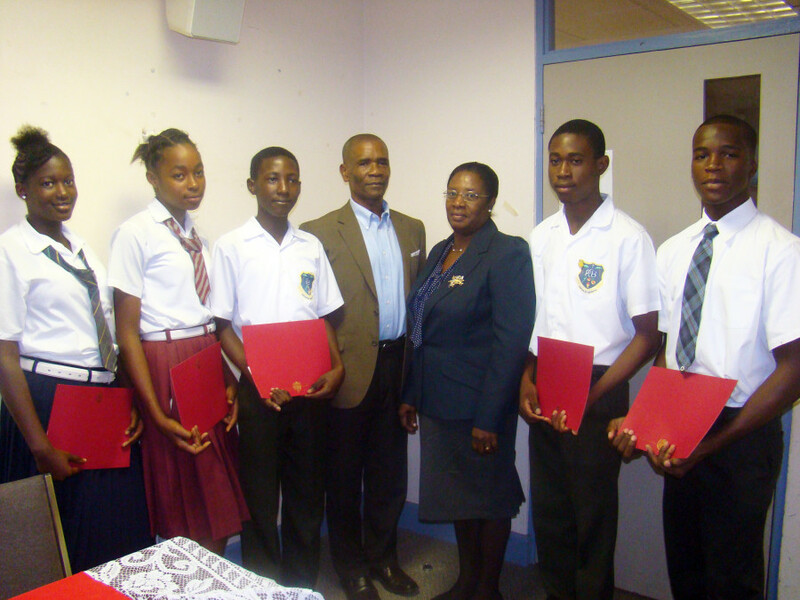 The Ministry of Education and Human Resource Development in collaboration with the Grenada Houston Association (GHA) honoured five students with scholarships at an award ceremony held in the Ministry of Education Conference Room on 12 December 2013. This is the third year that the GHA has reached out to Grenadian students, offering an opportunity for one child from each of Grenada’s 6 parishes and one child from Carriacou and Petite Martinique to receive financial assistance for academic expenses. Dr. J Jonathan Lewis, President of the GHA, was pleased to be able to give back to his home country but encouraged all in attendance to spread knowledge of the Association so that more students can take advantage of the scholarships available. Minister for Education and Human Resource Development, Honourable Anthony Boatswain, commended the Grenada Houston Association for their initiative that helps, not only the students, but the government on a whole. “Whenever I hear about any organisation making contributions I feel extremely pleased because I see it as, indirectly, a contribution being made to the government. If your organisation was not involved in this scholarship programme it means that government had to come forward because there are some services that we cannot deny our students,” Minister Boatswain said. Funds for the scholarship are raised at the Grenada Houston Association’s Annual Fund-Raising Gala that will be held in February of next year; coinciding with Grenada’s 40th Anniversary as an independent nation. The five students awarded received cheques in the sum of USD$500.00 each. Organizers hope that this amount will be increased in the coming years. To date, 21 Grenadian students, in secondary and tertiary level schools, have received financial assistance from the Grenada Houston Association.